This Maple Walnut Banana Coffee Cake will be the shining star of any breakfast or brunch buffet. It comes together easily, no mixer needed! “Could we stop at the grocery store?” I asked Scott on our way home from an event we had attended. “Sure, what do you need”? “It won’t take long, I just have to pick up a few bananas”, I told him. “More bananas? he exclaimed. “Wow, we’ve gone through a mountain of bananas over the last two weeks!” He’s right, I’ve been working like a mad scientist on this Banana Coffee Cake, and there have been more than a few renditions. Have you ever had a coffee cake “eat” all the lovely crumbles you sprinkle on top before baking? One last look before closing the oven door reveals a gorgeous crumb topping. Then when the timer goes off to signal the wonderful smelling cake is done, it’s a huge shock. The crumbs have gone AWOL, with just a scatter still visible in the center of the coffee cake. 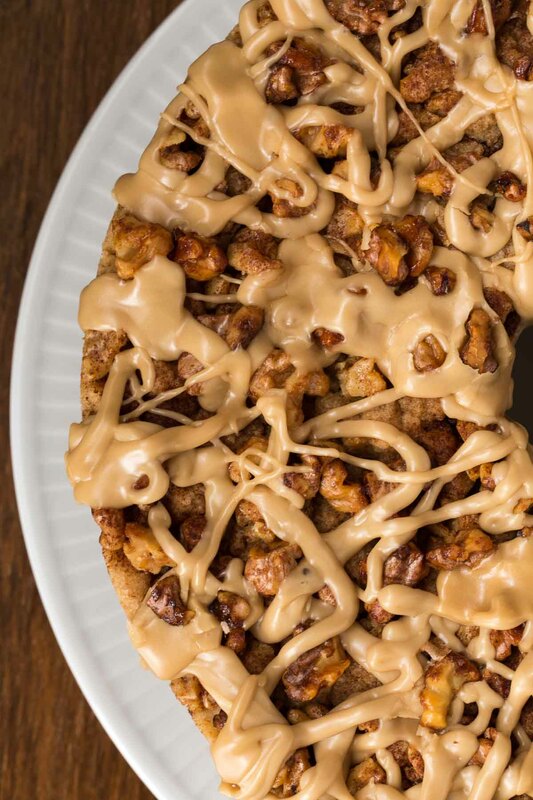 If you’ve experienced this disappointing phenomenon, you’re going to appreciate this Maple Walnut Banana Coffee Cake recipe. 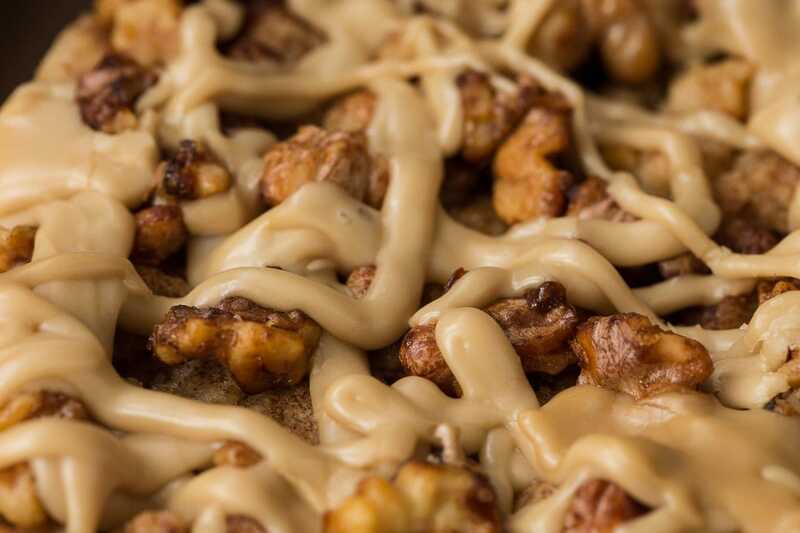 The batter is baked for 30 minutes before the sweet, cinnamon-y walnut topping and a scatter of walnuts is added. Then it goes back in the oven until it’s all golden and beautiful. 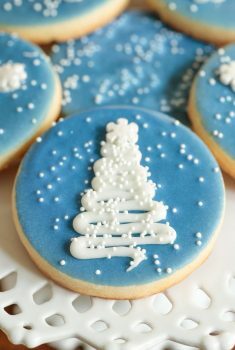 You can stop there, add a sprinkle of powdered sugar or be over-the-top extravagant and add ribbons of delicious maple icing. Oh, and the walnuts! They’re treated with a super simple splash of oil and honey before baking which transforms them during their stint in the oven into golden, crunchy, caramelized bites of deliciousness. Pecans could be subbed for the walnuts with equally wonderful results. 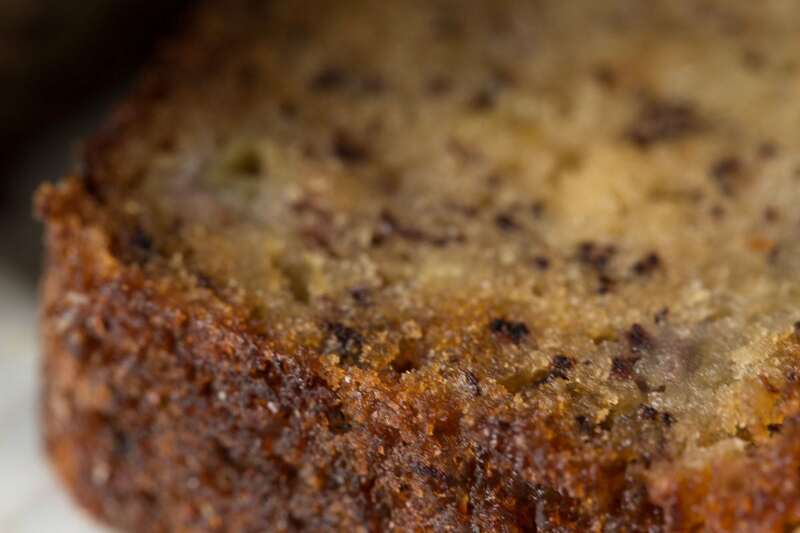 The cake itself is moist, tender and loaded with delicious banana flavor. So there you have it, another wonderful way to use up that seemingly perpetual supply of overripe bananas that congregate in the fruit bowl. 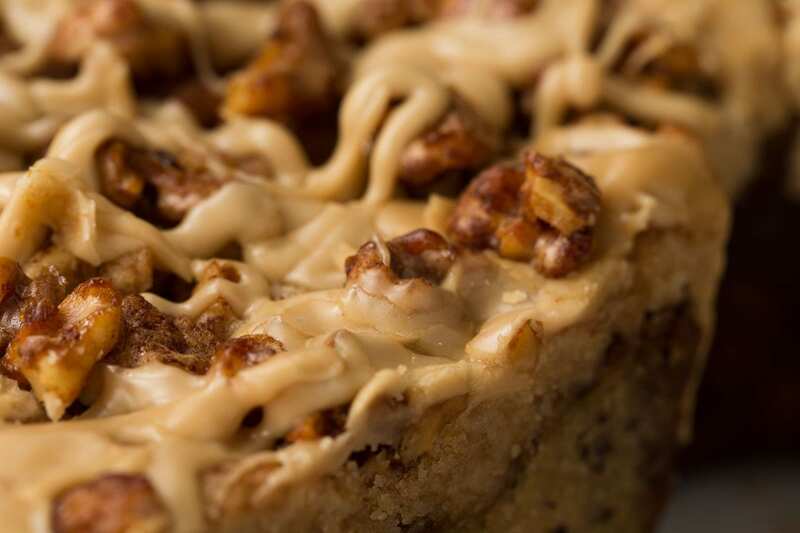 Or, you might be like me and find yourself buying a mountain of bananas, just to make this delicious Maple Walnut Banana Coffee Cake over and over again. Either way, the results will be spectacular! Be sure to grease your pan(s) well. There’s nothing more disappointing than a lovely cake that sticks to the pan. I like to use baking spray, which is a combination of flour and shortening. There are several companies that make this type of spray as well as lots of generic versions. I like Baker’s Joy but have also used other brands with good success. Don’t use green bananas in this recipe. You want bananas with lots of sugar spots (brown spots). Lots of grocery stores will actually have a little bin tucked away in some corner with over ripe bananas that are for sale at a reduced price. Check with your store’s produce manager on this. An easy way to mash bananas for baking? Place ripe bananas in a zip lock bag. Seal the bag and squish, squish, squish. When the bananas are fairly lump-free, just snip off a bottom corner of the bag and squeeze the amount needed into a measuring cup. For a less sweet version of this banana coffee cake, feel free to omit the maple drizzle. This banana coffee cake keeps well, in fact, it seems to get even better! Just wrap it in plastic wrap and store at room temperature for 2-3 days. 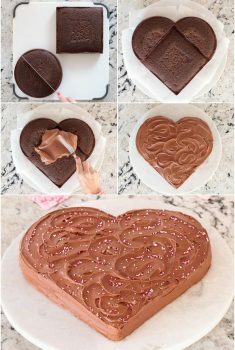 I use a fork or a small whisk to drizzle the icing over the top of the cake. This is the fun part and doesn’t take any expertise. It’s just a random drizzle. For a delicious twist, swap 1 tablespoon of strong coffee for 1 tablespoon of the half and half in the maple drizzle. Scott liked that even better than the standard recipe! Although I call this a coffee cake, don’t limit it to breakfast or brunch. It would also make a fabulous dessert, any time of day! If you’re making this Banana Coffee Cake and want to freeze for enjoying later, let it cool completely after baking. Then put it in the freezer uncovered for about an hour. Once it’s nice and firm, you can pull it out and wrap it securely with plastic wrap or foil and not smush the cake. 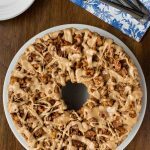 If you love coffee cake but don’t have any bananas on hand and/or don’t feel like running to the market, this Easy Overnight Coffee Cake is another super delicious crowd pleaser! This Maple Walnut Banana Coffee Cake will be the shining star of any breakfast or brunch buffet and comes together easily, without pulling out your mixer! Preheat oven to 375ºF. Spray a tube pan or a coffee cake pan with baking spray. Wrap pan in heavy duty foil or two thicknesses of regular foil. This will prevent the crust from getting too brown. Make the cinnamon crumb topping: combine flour, sugar and cinnamon in a medium-size bowl. Place butter in a small microwave-safe bowl and cook for 30 seconds on high power until partially melted. Add butter to flour mixture and stir with a fork until large clumps form. Refrigerate crumb topping till ready to use. For the walnuts, combine walnuts, oil and honey and stir well until walnuts are well coated. Set aside. Whisk together bananas, sugar and eggs in a large bowl. Add oil and vanilla. Stir until well combined. The oil will seem separated at first, just keep stirring till it's all incorporated. Sprinkle flour, baking soda, baking powder and salt over the top of the banana mixture. Stir just until all flour disappears. Scrape the bowl to make sure no flour remains. Transfer batter (it will be fairly thin) to prepared pan. Do not add crumb mixture yet. Bake for 30 minutes. Remove from oven to add the crumb mixture. Remove crumb mixture from refrigerator and stir with a fork, breaking up any large clumps With your hand, gently sprinkle crumb mixture evenly over top of the coffee cake, breaking up any remaining large clumps. Sprinkle prepared walnuts over the top of the crumb mixture, gently tucking some of them into the empty spots. Use a light touch for this step as you don't want to compress the cake itself. Return to oven and bake for another 25-30 minutes, or until a toothpick inserted in the center comes out clean. Cover top of pan lightly with a piece foil during last 10 minutes, if browning too much. Remove foil and allow the coffee cake to cool in pan for 30 minutes. Invert onto a dinner plate, then invert again onto a cooling rack so that crumbs and walnuts are on top. Cool completely. 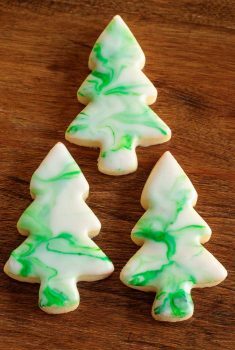 Serve unadorned or drizzle in random ribbons with maple icing (see below). To make the maple drizzle, combine butter, brown sugar and half and half in a medium-size microwave-safe bowl. Cook on high power for 1 minute. Remove from microwave and stir well then cook for another 30 seconds on high. Add powdered sugar and stir until smooth. Drizzle over cake in random ribbons. This is called a coffee cake but there is no coffee in the recipe. I am quite confused. there is a suggestion for coffee in the drizzle, but the cake is repeatedly referred to as a coffee cake. Hi Amy, you’re right, that is confusing. 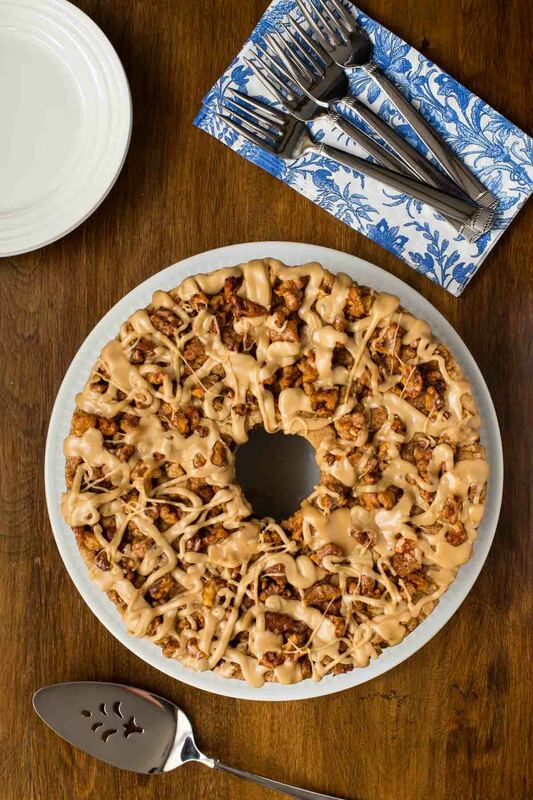 Not sure where you’re from but here in the U.S. we refer to a cake that would be served from breakfast or brunch as a “coffee cake”. I guess the name probably came because they’re nice to pair with a good cup of coffee. Sorry for the confusion. Made the cake tonight it was amazing. However, I was not sure about the maple drizzle the direction never mentioned the powdered sugar. I just mix all the ingredients and mix with the powdered sugar and poured over the cake. Thanks so much, Gail. I’ve amended the recipe. I appreciate you letting me know. question- would a bundt pan work?? Thanks. Waiting to make this when you answer. Hi Brenda, you could use a bundt pan but the problem with a bundt is that the topping will be on the bottom of the cake, as you normally serve a bundt with the rounded side up. That being said, you could serve with the rounded side down but it might be a little tipsy. This is a gorgeous recipe. There’s not a single word in the title that doesn’t make me drool! Haha! I love it Christina! Hope you enjoy it! Oh. Oh DARLING. This cake is everything I dream about!!! Your photos are incredibly enticing, too! Yup, we always have too many bananas on hand (is that even possible?!). This would be a great use for some of them. Great crumb tip! And super recipe — thanks. Wow! love the crumb on this cake, it is perfection, along with the walnuts and icing of course. Lovely cake Chris!! I have a pile of bananas that need a purpose Chris – so this is perfect. I bet everyone loves it. Thanks! Gosh you are artistic when it comes to decorating food, Chris! Everything always looks beautiful here and your coffee cake sounds wonderful! Holy moly this cake looks amazing Chris! That glaze…yummy! Perfect for holiday brunches! Such an irresistible coffee cake – your topping looks incredible! Well fancy that I just bought a trough of walnuts, just because. This beauty is worth an extra trip to the store for bananas and thanks for all the recipe testing you do. Looks fantastic..Gosh yo u are good.. non stop!! Mmmmm….I’m with Scott, that coffee version of the drizzle sounds incredible! And hooray for yummy streusel that sticks around!! Thank goodness you found a way to prevent AWOL crumb topping!! That’s my favorite part of a coffee cake. 🙂 Banana coffee cake sounds scrumptious. I surely can’t resist anything with streusel! Thanks for sharing, Chris. Hmmm, from my computer, it appears that you have the recipe ingredients, but no directions. But maybe that is just on my end? I absolutely love your idea for mashing bananas. You know absolutely everything about cooking! 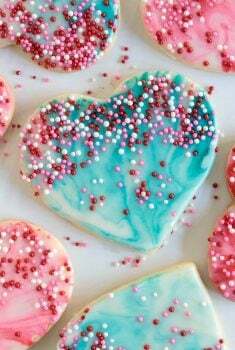 I just may have to make this at Christmas! Thanks so much Ginny, somehow the directions didn’t stick! Fixed now!